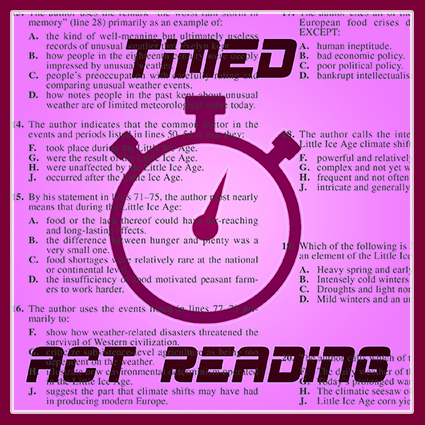 Struggling with speed and comprehension on the Reading section of the ACT? Frustrated because you cant get to all the questions? Reading on standardized tests like the ACT is a skill that can be taught and practiced. If you want to learn the strategies for understanding test passages and answering questions quickly and accurately, this session is for you. In our Timed ACT Reading class, students review the powerful Chariot Learning strategies for ACT Reading, then work on official passages and questions under timed supervision. We review after each passage to provide students the coaching and insight required for real progress. This is a single 2-hour class open to both new and existing Chariot Learning students. The fee is $80 for new students and $70 for current and past Chariot Learning tutoring students. Registration in advance is required. No refunds will be issued on the day of the scheduled session.